If your yard is filled with trees that limit sunlight, choose shade loving plants that require little sunlight to brighten up your landscape. Lady's Mantle makes a nice addition to your shade garden and is a culinary herb that earned its name because of the scalloped-shaped leaves, which historically people thought looked like the mantle of the Virgin Mary. It provides an attractive silver-gray ground cover that features sprays of dainty chartreuse flowers June through August. If you don't collect dead flowers before they fall, they will drop seeds and spread. Lady's Mantle grows best in moist, fertile soil that is shaded in the afternoon. It grows 6-24 inches in height. Hydrangea are available in a number of varieties and can be grouped into four categories that help you know which variety will work in your climate. They thrive in well-drained, rich soil, and need plenty of water. Mophead Hydrangeas - These are the most popular hydrangeas grown in home gardens and landscapes. Their full round flowering "mopheads" are blue or pink with a few white varieties. Annabelle -- Annabelle sports stunning white heads of blooms often more than 10 inches in diameter. It blooms every year even after severe pruning or harsh winters. Oakleaf Hydrangea -- The Oakleaf Hydrangea is named for the shape of its gorgeous big leaves. It can tolerate and even thrive in sunnier areas than the mophead and if you plant them in a sunny location that gets afternoon shade, the leaves often turn to brilliant reds, oranges, and yellows in the fall. Paniculata Hydrangeas - This variety grows and blooms in a wide variety of climates and unlike mopheads, they need several hours of sun to grow well. 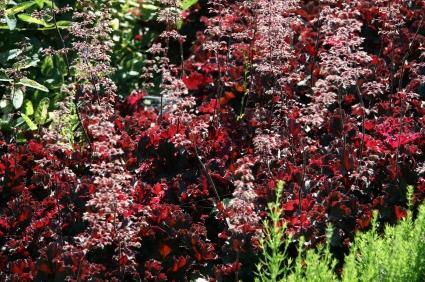 Coral Bells grow best in well-drained but moist soil with light shade. This biennial plant has been a part of gardens throughout history. Not only has it been grown for cut flowers but also for medicinal purposes too. Foxglove grows on stalks 3-6 feet high and usually flowers in July. It's important to note though, it won't bloom until the second season. This hardy perennial sports nodding bell-like flowers in a pleasant palette of colors and they stay colorful for several months because they are an evergreen perennial. The plant can grow up to two-feet tall and have 50 or more flowers. These flowers grow to 2-3 feet and prefer afternoon shade. The plants mentioned in this article are just a handful of the many shade plants available. Use them like colors on a painter's palette to create a landscape you enjoy.